So how is it almost June already??? I know I complain about the time flying by so fast all the time, but seriously - it's almost summer! My kids are almost out of school and I still need to figure out summer plans for them...sheesh. And I've had all these grand ideas of a bunch of spring sweets and crafts to do with them, and never got to really any of those I was thinking about doing in April and May and here we are at June. Oh well, we played Chutes and Ladders and sorted Legos into colors so it's easier for them to rebuild some stuff, and we flew kites this weekend too. 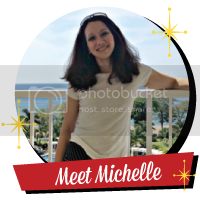 I'm hoping that's more important and they remember that fun stuff when they look back versus me having a few more blog posts! Priorities right?! Well I did get a chance to make a couple quick treats for a family party. 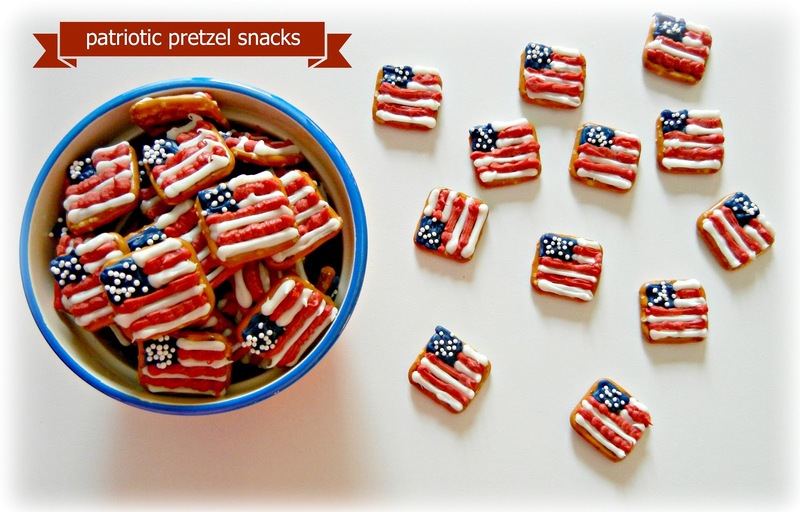 Some fun and easy flag pretzels and some mini graduation hat pretzel snacks. The graduation hats are just the hats that you can find here but in mini form - that Bakerella is so smart and fun (shhh, I pretend I know her and we're friends, she's met so many people she probably would be too nice and polite to say otherwise!). The bases are mini Reese's peanut butter cups (and because my kids have nut allergies) I also found mini Rolo candy. 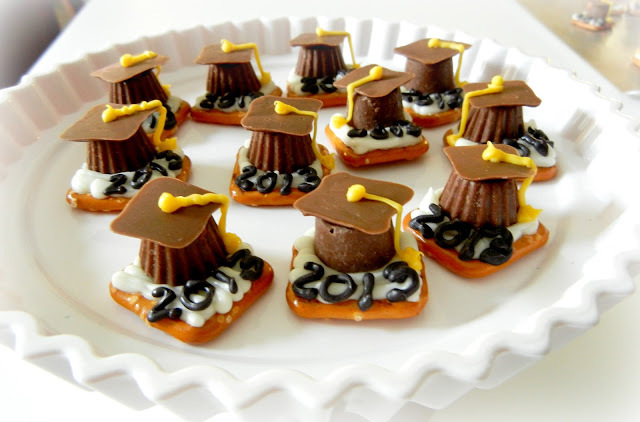 For the graduation hats, start with a square pretzel base. 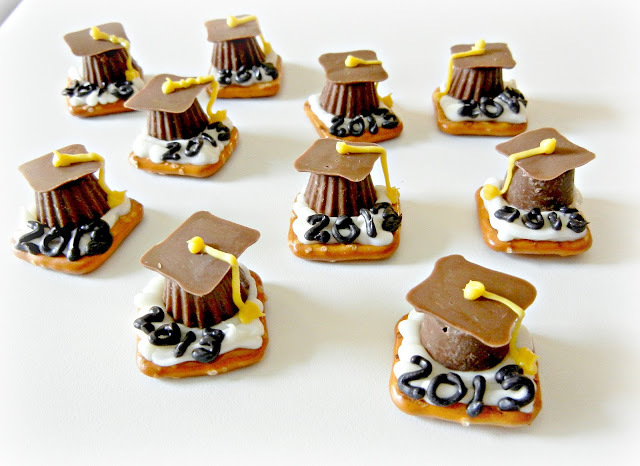 Add some white chocolate or candy melt to the pretzel, add the Rolo or peanut butter cup, and then add a small square of chocolate for the top of the graduation hat. I just melted some chocolate and piped out squares freehand and let harden. Once hardened, attach with more melted chocolate to the candy base. 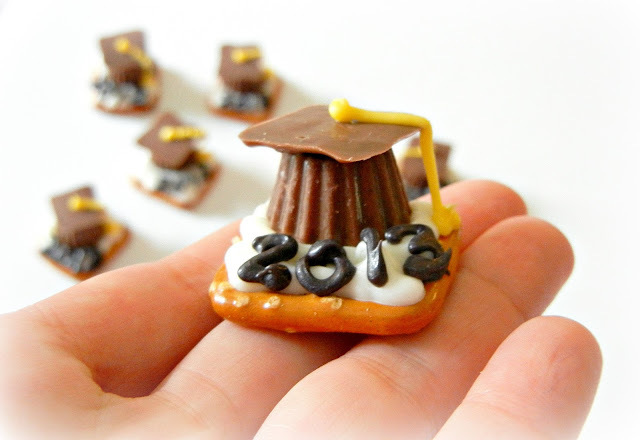 Add a tassel with some yellow candy melt (or whatever color works for your graduate!). I added the year in black candy melt too. 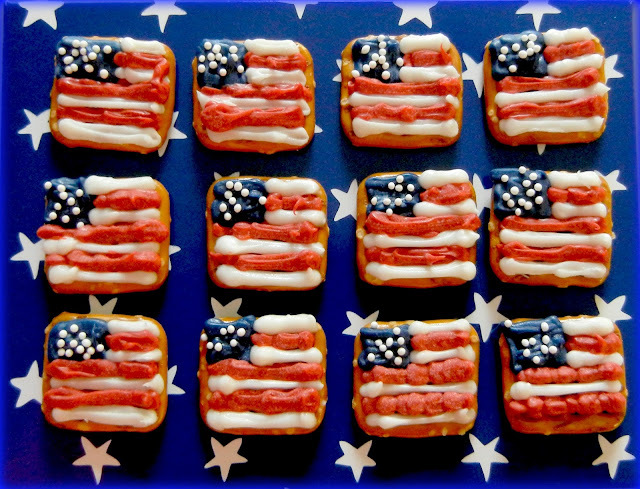 The flags are also on square pretzel bases. All the detail is candy melt in red, white and blue. I didn't have any mini star sprinkles so just used some white nonpareils - which worked pretty well for this and it was quick, just sprinkle them on the blue candy melt while it's still wet. These really didn't take much time to put together. Really the longest part was melting the candy in the microwave in intervals to do the red, white and blue parts of the flag. And you get some sweet and salty snacks that really are so tasty - you can't eat just one! These type of pretzel snacks really are easy and fun to bring to a get together. I've done other versions here for 4th of July, here for a Super Bowl party, and here for Halloween. All a little different but fun and best of all, quick and simple. Congrats to my cousins as well!!! One graduated from 8th grade (a big high schooler now), one from college (dude, time to get a real job) and another from medical school (woohoo free medical advice!). Very awesome and proud of the bunch of ya! 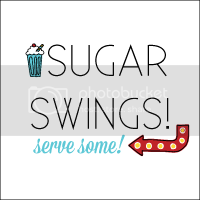 I'm actually the oldest grandkid in our family, so it really is amazing to see my "little" cousins in Swingers speak "all grows up"! Hope you are enjoying the last days of May and the beginning of June - here is one thing I pinned ages ago that I am DEFINITELY doing this summer! Thanks for stopping by and have a great weekend! thanks Sue, I love sweet and salty together! Both of them are super cute...love it!! Thanks so much Jill! 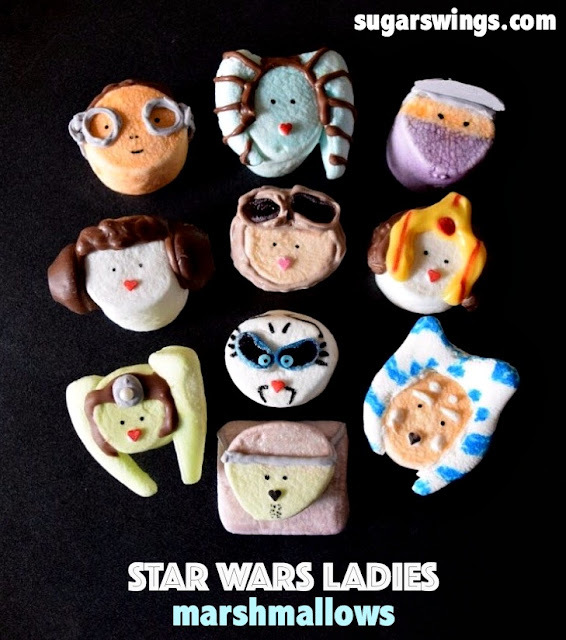 My kids loved them (and they tend to get tired of my sweet stuff!) haha. Both of these ideas are so, so cute! I've got to try the flags. Thanks so much for the great idea. This will be a great summer activity to do with my three little boys. Have a great weekend! Thanks! It's so easy for kids to help with these!! Thanks Jen, so simple too!! These are so cute! 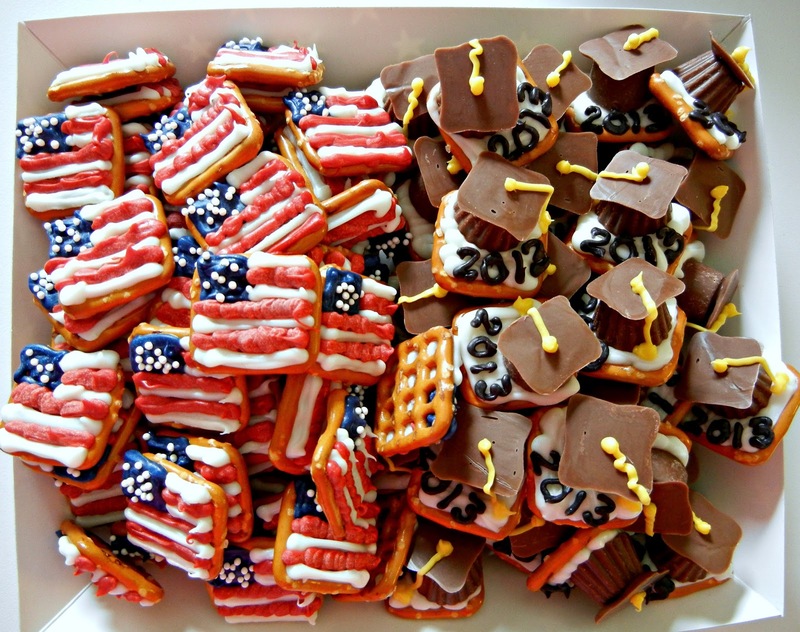 I tried making the graduation pretzels but am having trouble doing the tassles.. I can't get it to hang down like a tassle, it just falls onto the bottom pretzel. What technique did you use? I made sure the candy wasn't too melted, if so you are right it may just fall to the bottom. When less melted (but still "pipeable" I put in a zip lock and snip an end) it worked out well for me. You can see from pics the tassels are not perfect and some are more messy as it's a little hard to exactly control how it falls. Alternatively, you could use small strips of fondant for this! Good luck! these are so cute! Love them! 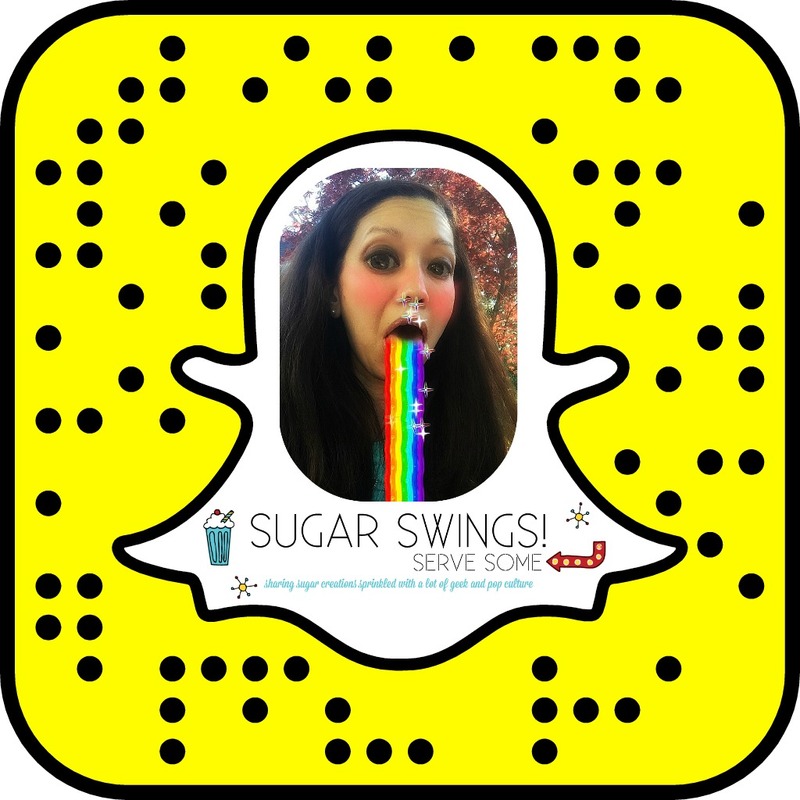 I've pinned it! Thanks for sharing at Two Cup Tuesday at Pint Sized Baker. I want a handful of those cute flags! 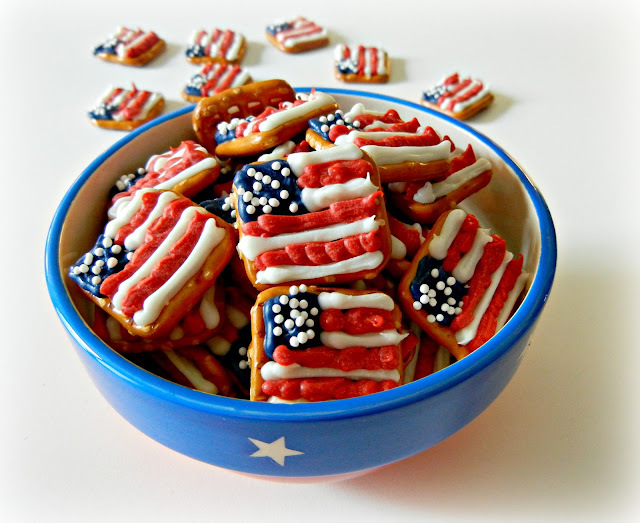 Patriotic and fun. I pinned them to my Patriotic Food board. I just now came across your page. Soo adorable. Wish I would of seen this before. Just had my son's grad party back in May. This would of been great. I will have to remember it when my last baby graduates in 2 years :) take care.